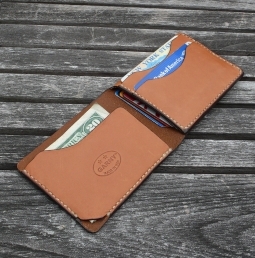 Hand made from vegetable dyed cow hide. Left side has 2 credit card slots on top and 1 larger compartment under, right side has 1 large pocket, on back 1 large pocket. 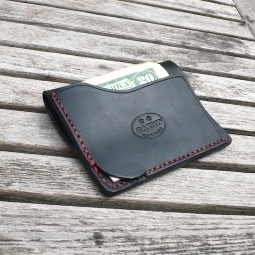 Designed to hold credit cards (about 8-10), drivers license and or business cards and folded $ bills. Please expect natural markings.